As part of indoor air quality strategy of Control, Filter, and Refresh, controlling your indoor humidity is very important! You may not realize this, but in many cases, the air inside your home is drier than a desert. Dry, indoor air is often the culprit for such common problems as itchy or cracked skin, eye irritation, dry, stuffy nasal passages and damaged home furnishings in your home. In addition to these comfort issues, dry indoor air can increase the possibility of catching or transmitting cold and flu viruses and can reduce the efficiency and effectiveness of your heating system. All of these problems can be alleviated with the help of a humidifier. Offering Four different humidifiers, they will put the moisture back into your indoor air so you can relax in warm, soothing comfort. 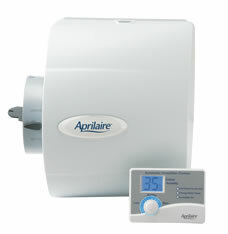 Welcome to our Aprilaire Humidifiers Page! 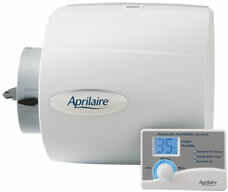 APRILAIRE Humidifier Models 400, 500, 600, 700 series! Stop having a dry house, scratchy dry nose and throat in the winter time. Improve the way you feel! Stop getting shocked in the winter time after walking across the carpet and touching something metal. Protect your furniture and belongings by having the right humidity in your home. Stop furniture and woodwork from cracking and separating in the winter time. Make your home a healthier place to live by controlling the humidity in your home. All the Aprilaire humidifiers pictured below come with a Humidistat, Water Saddle Tap Valve, New Water Panel, Sheet Metal Cut-out Template, Installation screws, Complete Installation Instructions and Owner's Manual. 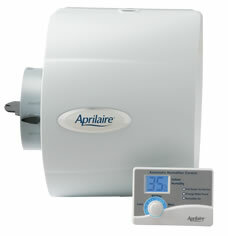 Aprilaire 500 & 600 Humidifiers come with low voltage 24 volt transformers. The Model 700 has it's own 24 volt transformer stored inside the body of the humidifier. 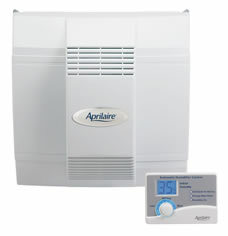 Aprilaire 600 & 700 humidifiers come with the New Computer Controlled, Auto-Trac Automatic humidistat with outdoor temperature sensor. Give us a call about your Aprilaire Humidifer parts and service needs!